Have you guys tried Red Lentil Kofta before?! They were one of my favorite foods I discovered on one of my first visits to Turkey a few years ago. I instantly fell in LOOOOOOOVE with the perfect texture as well as the tasty, savory and flavorful touch of these lovely Mediterranean patties! Filled with red lentil, bulgar, white onion, garlic, a pinch of cumin and fresh parsley, these simple Red Lentil Kofta soon became one of my favorite foods in Turkish cuisine. 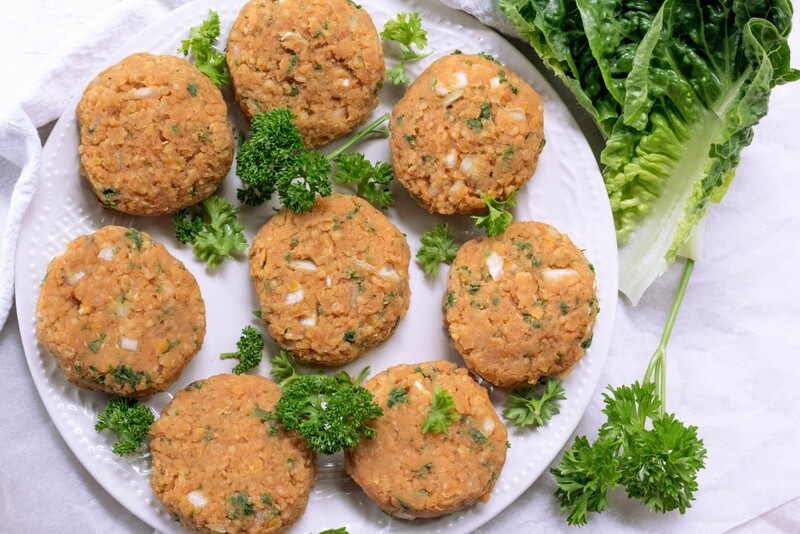 You can imagine that after goning vegan, I was happy to discover that these delicious Red Lentil Kofta Patties, like so many foods of the Mediterranean, are 10o% naturally plant-based! The cool thing about Red Lentil Kofta is that they don’t require ANY baking, pan frying or any of that stuff associated with traditional “burger” type recipes! You cook the red lentils, add in the bulgar before the red lentils are almost done cooking. 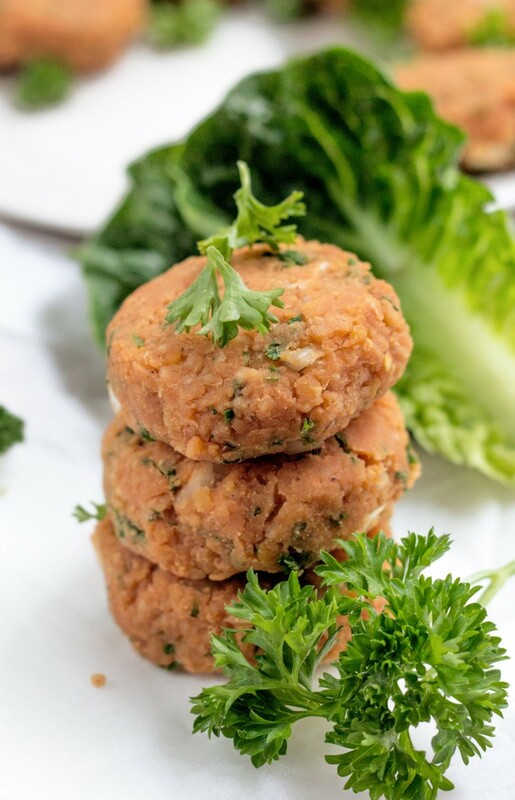 Once the bulgar is softened, toss in the white onion, garlic and parsley, give everything a GOOD stir and all you have left to do is shape these Red Lentil Kofta into the perfect patty! My other favorite part about Red Lentil Kofta is that you can enjoy them straight away warm or leave them to cool and enjoy cold later. 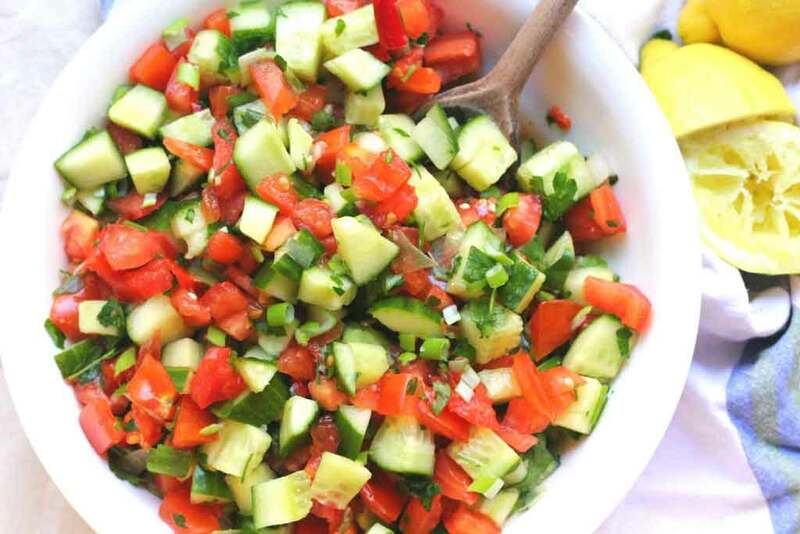 I like them both ways but have a soft spot for them cold, alongside my Mediterranean Cucumber Tomato Salad! These make a super fun and different (unless you are Turkish and cook these often, lol!) Summer appetizer or side to impress your friends and loved ones with. J and I can never get enough of these Red Lentil Kofta when I whip them up at home. 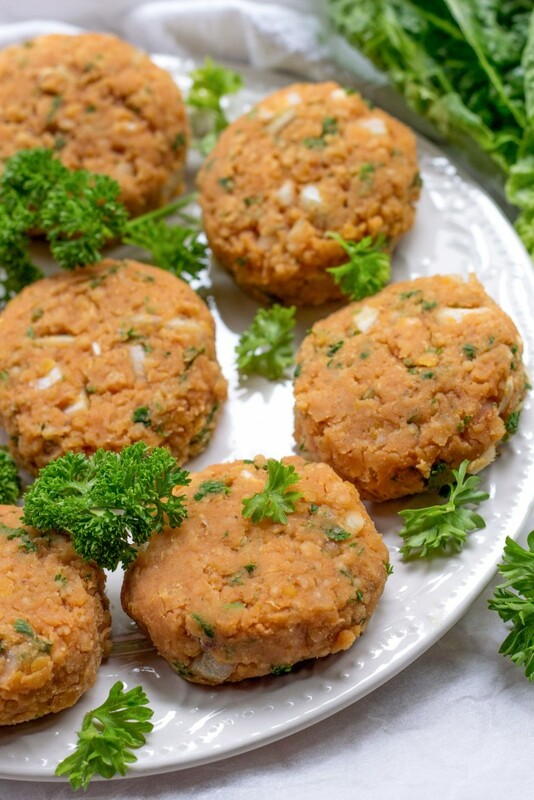 These red lentil kofta patties are one of my favorite foods. They are incredibly flavorful, easy to whip up and bring me right back to Turkey. Enjoy warm right away or later with a salad cold as an appetizer or side. Prepare and dice the white onion, garlic and parsley. Rinse the red lentils. Cook the red lentils in a large pot with 4 cups of water, ground cumin, hot pepper flakes, paprika, and tomato paste over medium-high heat. Cover and leave to cook for 15-18 minutes until the water is almost all absorbed. Add the bulgar. Turn the stove off. Stir the bulgar and lentils together. Cover and leave to sit for 5 minutes until the rest of the water is absorbed and the bulgar is cooked. Stir the white onion, garlic and parsley into the red lentil mixture. Add sea salt to taste. Leave to cool in the fridge for 5 – 10 minutes before rolling into balls. Scoop and pack the red lentil mixture with an ice cream scoop or spoon onto a tray or large plate. Shape the red lentil patties into a patty shape with the palm of your hand. 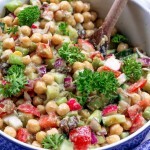 Enjoy straight away warm or later cold with salad. Enjoy! 1) Substitute fine bulgar for super fine couscous. I like red lentils and am always looking for new ways to use them. These look very tasty. As a change of pace do see any reason why these could not be breaded and fried (reasons other than adding a lot of fat that is) sort of like a red lentil falafel? Ceara, I plan on making these this evening. They sound great. You mentioned you revised the recipe to add salt, and didn’t have it before because your tomato paste had salt. I see the recipe calls for tomato puree. When you added the salt did you switch out the tomato paste for tomato puree? Use tomato paste (the thick stuff!). I hope this clears things up!! Enjoy the kofta. Let me know how they turn out! Thank you so much for sharing this! I have had these at a Turkish friend’s place on lot of occasions and simply couldn’t wait to try it myself. I altered your recipe a bit – sautéed the onion and added the lentil in the same pan with onion, garlic and ginger (yes, i added a little ginger as well – i love the onion+ginger+garlic trio). I also added a dash of (clove + cinnamon + nutmeg) powder with some extra paprika and ended it with some lime juice. Even my 18mo picky eater thanks you. Please keep posting more. I made these for dinner last night and just wanted to say thank you; they were amazing! I had to try really hard not to eat it all straight from the pan and wait for it to cool to shape it in to patties. I just had some cold for lunch too and they are great that way as well. This will definitely become one of my regular dishes. Thanks! Thank you for taking the time to share your lovely feedback, Carrie! I am so happy that you enjoyed the lentils. How you served them sounds delicious! I love that you used quinoa to make this recipe gluten free! These look lovely! Question: For a gluten-free version, would millet work instead of bulgur or cous cous? Thank you, Annetta! I haven’t cooked much with millet in the kitchen – does it cook up similar to couscous or bulgar? If so, then it might work well in this recipe. The bulgar is an important ingredient because it binds everything together. I would love to know your results if you end up trying them! These look fantastic! I ‘m from Turkey and mercimek köftesi is one of my favorite snacks. I love the way you shape them, so cute. I sometimes make these and take to picnic. Kids love them too! 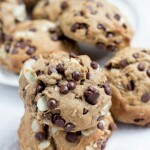 I love your recipe and will have to try it soon! There is a slightly difference in our common recipe and I’d love to share it if you don’t mind. We saute finely chopped onion with 3-4 tablespoons olive and add 1 teaspoon tomato or pepper paste. Cook for 2-3 minutes and add this into bulgur and lentil mixture. Then we combine this with chopped green onion and parsley. Squeeze lemon over them and mix well. Ready to shape. Thank you so much for the lovely comment, Zerrin! <3 Mercimek Koftesi is one of my favorite Turkish foods as well 🙂 Thank you for sharing the traditional way of making the kofta - I love the texture of the raw onion but need to try it your way as well! It sounds delicious. I will definitively be squeezing lemon on mine next time too! This looks great! Using the ice cream scooper, how many patties does this make? I absolutely love the ingredients in these babies! They look so delicious and healthy— the best kind of recipe in my book. Can’t wait to try! I have never heard of kofta before but these look sooo amazing and delicious! I love all of the ingredients, so I’m sure I would love them. They kind of remind me of falafel a little, just with lentils instead of chickpeas. So weird that you don’t bake them, but funny enough when I saw the first picture, I thought that they weren’t baked, so that makes sense, lol. I would love to try these out, did you not use salt in the recipe? Just wondering how much you used! Looks amazing, thanks girl? Awesome thank you!! That makes sense, I knew there was a reason, lol! These look delicious! I love kofta, but I don’t think I’ve ever had them with red lentils before. And I love that you added bulgar…love that stuff! I have had meat kofta many times before, but I have never heard of a red lentil version before. Great idea for keeping it veggie.